Chassis Dimensions: 16.93" x 27.95" x 3.44"
Board Form Factor: Custom 16.7" x 17"
(2) PCIe* riser card brackets. 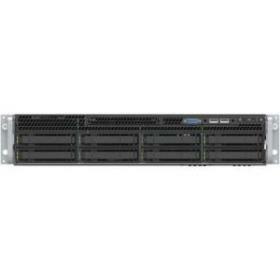 Description: Integrated 2U system featuring an Intel® Server Board S2600WF0R, supporting two 2nd Generation Intel® Xeon® Scalable processors, (8) 2.5 inch hot-swap drives, 24 DIMMs, (1)1100W redundant-capable power supply. Front Drive Form Factor: Hot-swap 2.5"